What continually makes the United States the place to be with respect to investment is the expectation that, when all is said and done, the rule of law generally prevails. One need only visit China, Japan and Russia to see that markets are generally manipulated by insiders. 1) Tech firms like Dell aggressively compete regarding strategic acquisitions and nothing speaks louder than “cash” or shares assumed to have the potential to appreciate. For most tech firms the largest source of cash is remarkably non-payment of taxes. This is due to the large stock option generated tax deductions with no corresponding outlay of cash, deductions associated with restricted stock, etc. These firms do not generally purchase shares on the open market to fulfill such commitments but rather simply print up new stock. Put another way, if you can generate a billion dollars of tax deductions, you can effectively reduce your tax bill by 350 million, which is nothing short of cold hard cash in the bank, if you are profitable. The biggest such deductions come from the issuance of stock or large write-downs of assets, for which there is no cash cost to the company. If one compares Dell to Apple and Google it doesn’t take long to see that Apple and Google have been veritable tax deduction making machines via the issuance of non-qualified stock options. Consider the following analysis based upon each companies most recently released 10K reports. Also consider that large exercises in options at Apple and Google in the last 5 years have generated staggering tax deductions while Dell has generated little. One could even argue that the whole anti-trust action against Google was misdirected in that the focus should instead be on tax rules that have created a situation in which they are relatively immune to competition. What tax paying publishing company could possible compete with a firm like Google that “coins” cash, to quote Henry Blodget, in the form of non-payment of taxes. The key point is that Dell is so underwater with its options that it can’t play the game any longer. What they need to do is go private, take a massive write-down and revalue the shares lower to create lower strike prices. Management can then issue two classes of options, not unlike what Bain Capital has done with respect to its own employees participation in deals. One class will have a greatly reduced exercise price that will accordingly result in massive tax deductions when exercised in a subsequent IPO, when Dell is taken public again. The beauty of this well worn scheme is that the amount expensed for the options is declared when granted, not when exercised. This often results in a tax deduction upon exercise years later that are ten times as great as the expense recognized. If Dell is taken private such deductions can then be allocated among Dell and other taxable private equity partners and result in effective tax rates of close to zero. This is because many private equity firms have tax exempt limited partners who have no use for tax deductions, examples being public pensions and foundations. Tax deductions are unusable for tax exempts. Those private equity firms like Silver Lake, whose largest limited partners are tax exempt investors, including Calpers that owns 10 percent of Silver Lake outright, use well worn schemes to allocate these deductions away from tax exempts, contrary to IRS rules, in particular the “fractions rule.” Remarkably, there is not only no discussion of this important rule but also no enforcement. Other major tax exempt investors in Silver Lake include the New Jersey Public Pension System. Is it not ironic that New Jersey Governor Chris Christie excoriated the Republican party leadership for its slow response in providing Hurricane Sandy relief while the State and other public pensions seek to profit at every turn from “buyout” funds? Especially when these buyouts decimate the very tax base relied upon to support the public pension system. In a perfect world Dell would also take a massive writedown now, prior to the buyout, so that this important value could be captured and quantified, that is the future tax deduction resulting from the write down. 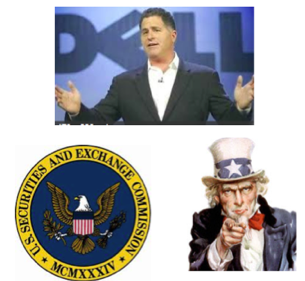 What Michael Dell wants to do is wait until after the buyout and pocket a larger share of any such deduction for himself. Clear disclosure of all existing unused net operating losses able to be used in future years should also be prominently disclosed.